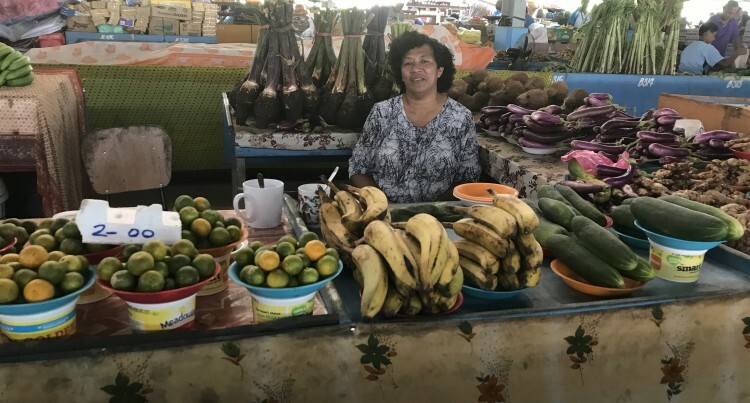 Venina Vakarusere at her stall at the Nausori market on June 4, 2018. Selling as a middleman at the Nausori Market is a new experience for Venina Vakarusere. Ms Vakarusre has been selling farm produce from their Lutu, Wainibuka farm for the past decade. This was after her elderly husband could not plant crops, vegetables and fruits no more. The shy 42-year-old of Lutu in Wainibuka said she needed to make money for the family. “I just thought that I can be my own boss and earn money. My only regret was why I did not make the change ear­lier as this is easy money,” she said. “We used to sell our own produce and at times the business was slow. However, we were able to accomplish a lot of things from the profit we made from selling as a middleman at the Nausori market. “Today, I buy my produce from farmers and then sell them. When any natural disaster occurs here we are greatly af­fected and the prices of root crops and vegetables are really high,” she said. She said selling from her stall she was able to accumulate revenue which as­sisted her five children’s education. “I have five children three boys’ and two girls’, the eldest is in Form Seven while the youngest is five year old,” she said. “Being a market vendor was not my first choice but through this I was able to put food on the table and educate my children. I decided to be a market vendor when I realised that I can get more money by selling at the market than farming.